HMRC has been accused at times of being less than vigorous in its pursuit of the money that is due to it, so thanks to the Daily Record for alerting us to the revitalised current priorities of a service that hardly ever makes a mistake. Debbie Balandis, from Glasgow, has had her benefit stopped while being asked to prove that she is not living as man and wife with Martin McColl, given a series of payments the service had identified. Martin McColl is the trading name of R S McColl, well-kent for providing newsagents and local shops throughout Scotland. 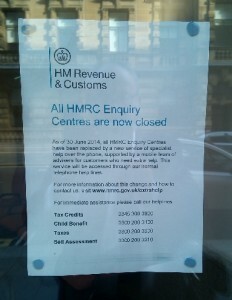 HMRC is not proposing to leave matters there, and it seems there are now further accusations of liaisons with men. That accusation would be self-defeating, because there is nothing in benefit regulations to prevent it. Overpayments are liable to occur either where a person has a non-dependant living in their household, or where two people are living together as man and wife. Neither of those appears to be relevant in this case. It does seem that Ms Balandis has done something to offend someone, and in our current system of secret justice and lettres de cachet, that is enough to make the heavens fall. To identify the payments, HMRC would have needed to gain access to Ms Balandis’s record of financial transactions They have managed to make time for this important work by some reallocation of priorities, such as closing their offices to the public. 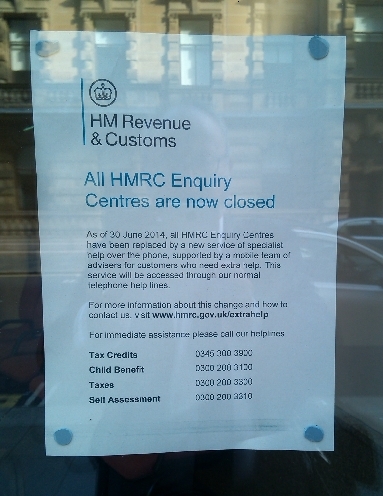 If HMRC is girded up to challenge Glaswegian mothers, can the multi-national corporations be far behind? I saw this poster in Glasgow on Thursday. It’s dated 30th June, so this may come as old news to better-informed readers, but I hadn’t realised that it had happened. There is now no open access to discuss issues relating to Tax Credits or Child Benefit. Attacking HMRC on a range of issues, a Times editorial comments: “Tax Credits have repeatedly been overpaid because changes in individual circumstances occur too frequently for the bureaucracy to keep up.” That’s quite true. But the Universal Credit scheme, contained in the Welfare Reform Bill currently passing through Parliament, relies centrally on the principle that it will be possible to respond to changes in people’s needs as they happen, “in real time”. It is not possible now, and it is not going to happen like that. The government has sidled away from the promise of a computer system that will cope with everything – no system could be expected to record changes in household circumstances as they happen. What they are currently relying on is the development of a faster PAYE system, which generally depends on income coming from employment. Changes to overpayment rules mean that claimants who are overpaid will have to repay money regardless of whether they could reasonably have known they had been told the wrong thing or were being paid the wrong amount – a situation which the Ombudsman has previously criticised for the instability it creates for low-income households.